Tadas Viskanta is the founder, editor and curator of the Abnormal Returns blog, where investors come to discover what is important and relevant to their world and bloggers go to see whether their efforts are sufficiently compelling to be included among the hand-selected links that investors pore over at Abnormal Returns each day. Tadas has an MBA from the University of Chicago and a BA from Indiana University. 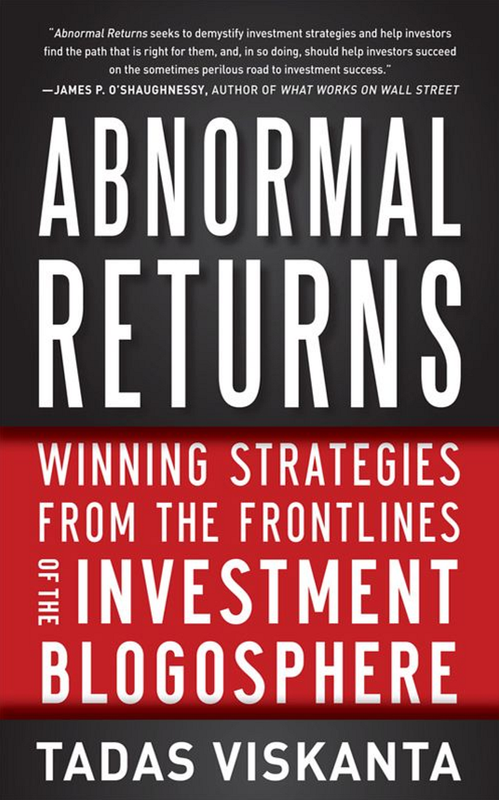 His first book, Abnormal Returns: Winning Strategies from the Frontlines of the Investment Blogosphere, was published a little over one month ago by McGraw-Hill and is available in hardback and digitally in a Kindle edition. I recently had a chance to talk with Tadas about the blog, the book and a number of issues related to investing. The following is an abridged version of our conversation. BL: What was it that inspired you to start the blog, Abnormal Returns? TV: I had a book proposal on hedge funds that had been shopped around and ultimately went nowhere. I had been keeping an eye on the nascent investment blogging scene and WordPress.com had just come online, so I figured that it must be a sign. BL: When you started, did you have a vision of becoming the destination site for the best financial links or did that happen by accident? TV: Purely by accident. I found out quickly I wasn’t the fastest blogger and that other bloggers were doing great work. It seemed natural to point to their work rather than do “me too” sort of work. Every blogger has to find their niche. BL: What has changed in your approach over time? TV: I just focus on things I’m interested in. I am circumspect in avoiding politics, which means that I also avoid economic policy issues. This frees up a ton of space (and time). I have blogged about the difference between a positive and normative blogosphere. The best posts focus on the data. I’m also getting better at being able to summarize stuff quickly. BL: Why is it that Abnormal Returns the book appeals to a broader audience than Abnormal Returns the blog? TV: The blog appeals to sophisticated individual investors and some institutional investors. By contrast, the book attempts to reach a broader audience. My concern is that maybe we bloggers don’t have the tools and vocabulary to reach a broad group of investors. To take an obvious example, Apple hides a lot of sophistication behind technology and there is an incentive for them to take that approach. In finance, those incentives have been ignored to date and financial services firms make money with complicated products and services. Something like a Vanguard balanced fund is a great fund for investors, but nobody is going to make a ton of money giving that type of advice. BL: What can be done in terms of changing the tools and vocabulary in order to reach that broader audience of investors? TV: ETFs are one tool, but not a solution in and of themselves. As far as the vocabulary is concerned, it’s a process, not a one-shot deal. We all broadly have the same sort of goals and deal with the same sort of issues. The important thing is to put investors on the path of saving and investing. BL: What sort of tools or issues do you think most investors should be focusing on? TV: The goal should be to be an efficient investor. To borrow an idea from tennis, it is important to avoid unforced errors – and specifically to avoid the things that can blow you up. In that regard, the three killers are leverage, complexity and liquidity. BL: Why do you think investors get into trouble? What are they doing wrong? TV: The DALBAR studies look at the way fund flows react to performance. Typically investors are buying high and selling low. Some of that has to do with the star manager system. An example is Bill Miller, where most of the money flowed into his fund at precisely the worst time. If you compare balanced funds, you don’t see as much “bad behavior.” With those types of funds, the focus seems to be more on overall portfolio performance, without the desire to tinker with performance. BL: What are your thoughts on diversification? Is it indeed the only free lunch in investing? TV: During the 2008 financial crisis there was only one diversification play: U.S. Treasuries. The challenge now is that real yields on Treasuries are negative, so that makes diversification into Treasuries a lot less attractive. There really is no cheap, safe asset at the moment. BL: Is the interconnectedness of markets and the globalization of the economy a good or bad thing for investors? TV: It just is. There is nothing anyone can do about increased globalization. You just need to adjust your thinking. The same can be said for any other market-related phenomenon. A lot of traders complain about high frequency trading, but until things change you have to adapt to the environment or find something else to do. BL: How should retail investors position themselves in light of all the uncertainty in the euro zone? Should they get in cash? Hedge? Ignore the news and sit tight? TV: The risk of a euro zone breakup is a big risk to the markets. But it isn’t all that different than other big existential risks we face. Investors need to have in place strategies that take into account big market moves. Trying to predict what happens in Europe is a tough game, so having in place a plan before things happen is key. The likelihood you will make sound decisions in the midst of a crisis is pretty small. BL: Are you a fan of options? TV: The financial crisis scared a lot of people out of the stock market. The great appeal of options is that they can be used to create structured returns that remove down side risk. I’m not crazy about how options are marketed. For instance, some try to say that covered calls are “income.” This is not correct. The money received for selling covered calls is really compensation for foregoing the possibility of potential gains. BL: When you think of the concept of “abnormal returns” in terms of the performance statistics of a hedge fund, mutual fund or other investment vehicle, what is your gut reaction? Is it concern that unseen risk lies just below the surface? That such returns are not sustainable? Other issues? Are the fees they charge going to eat up all of the alpha they generate? How can we identify these managers beforehand? It is easy to see which managers outperform ex-post. I talk in the book about how when we examine investment returns we are looking at some mix of skill and luck. Nobody wants to pay a manager for luck, but teasing out who has skill is no easy matter. BL: Is the quality of information you scan on a daily basis any better or worse than it was five years ago? Are investors getting better or worse information with each passing year? TV: As good or better. There is probably more noise than there has been prior. That is why it is important to have a strategy to either eliminate or at least filter the noise. Going on a news-free diet can serve this purpose for investors. Most investors have long investing horizons; therefore it makes sense for them to avoid the intraday noise that dominates the financial media. BL: Many readers of your book are probably worried about whether they will be financially secure in retirement? What should these investors be doing? TV: First of all, these are personal decisions – when to retire and how much money is enough. There are no right or wrong answers. That is why we call it ‘personal finance.’ Investors should try to push all of the buttons and pull all of the levers that they can to put the odds in their favor. Today’s low yield, low return environment makes this all the more important. BL: What sort of levers do you think investors should pay attention to? TV: For many people it is easier to find an extra 1% through more conscious consumption than it is to generate an additional 1% portfolio alpha, for instance. As far as investments are concerned, find incremental returns where you can, including areas such as harvesting tax losses. Ultimately, everyone must understand there are no guarantees.